We’ve spent the past few weeks posting items from issue #80’s 15 In Philly feature, our 15th-anniversary spotlight of favorite music from MAGNET’s hometown. Guess what? It’s year 16. This week, we pay attention to the newcomers, make amends for the omissions and basically try to cover our asses. Because all beatdowns are local. From the outside, Pi Lambda Phi looks just like every other University of Pennsylvania frat house on the 3900 block of Spruce Street. The large, three-story stone building is decorated with intricate carvings of leaves and vines and preceded by a tiered porch with iron and brick fencing. A giant gold column of a banner hangs from the rooftop, the end of it just barely brushing the cement of the porch. 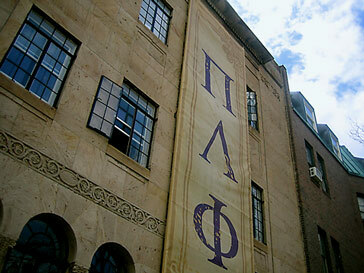 Three Greek letters, massive and purple, stare down at passersby: PLF. Of course, appearances can often be deceiving. While its flowerbeds may be littered with empty beer cans and plastic leis, the Pi Lam house is better known as a music venue than a Thirsty Thursday hot spot. The 30-some Pi Lam brothers are more likely to get their exercise biking to Wawa for cigarettes than playing lacrosse, and they’re much more fond of brightly colored American Apparel tees than Abercrombie polos with popped collars. Instead of Natty Light, PBR is their drink of choice. Pi Lam has been a fixture on the Philly music scene since the early ’80s, when the dwindling fraternity was overtaken by a group of punk-minded miscreants—or so the story goes. Either way, Pi Lambda Phi started hosting shows, and over the course of the next two decades, acts such as the Dead Milkmen, Hüsker Dü, Of Montreal, Nada Surf and Yo La Tengo played sets at the Pi Lam house. The fraternity also became known for its yearly event, the Human Barbecue: more than 14 hours of live music and inebriated fun usually held in early spring. Last year marked the 30th anniversary of the tradition, which always attracts a large, diverse crowd of Pi Lam alums, local music fans and assorted other characters (including some of the attendees of 1994’s East Coast Anarchist Gathering, which Pi Lam also hosted). With officer titles such as “PCP” (Pledge Class President) and a considerable amount of credibility in the often-snobby West Philly noise-rock scene, UPenn’s branch of Pi Lambda Phi is no ordinary fraternity, but its members wear their Greek letters as proudly as they wear their guitar straps and Chuck Taylors.